Remember the Nigerian Model who went viral last year for claiming that her hairstyle costs a whopping N40million? Well she has caused quite some stir inside a market in Lagos during her PVC campaign yesterday. This is even as the continuous voters registration is likely to end in August. Rocking her signature hairstyle which drew wide attention and momentary pause in business activities, Chika Lann advised that the only way Nigerians can get their voices heard is through their PVCs. 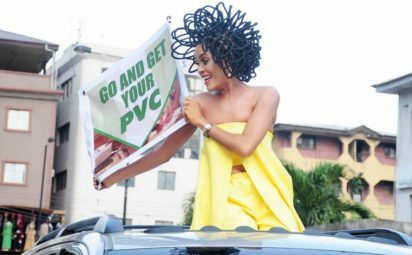 0 Response to "Popular Model, Chika Lann With Her N40million Hair Causes Stir At Lagos Market During PVC Campaign"